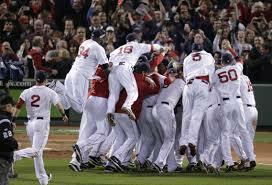 Less than a year ago the Boston Red Sox were celebrating their third World Series title in the last 10 years. Now just 10 months removed from that celebration, the Red Sox are looking at one of the worst post-World Series title collapses in major league history. With a record of 57-74 (.435 winning percentage) this year, they will have to win 24 of their last 31 games to avoid a sub-.500 record thus becoming the 17th team in history to win a World Series one year and have a winning percentage under .500 the following year. One thing is for sure: The Red Sox are glad that the 1998 Florida Marlins had their historic collapse after they won the World Series in 1997. The ’97 Marlins defeated the Cleveland Indians four games to three to win the title that year. The following season the Marlins won only 54 games (and lost 108) for a .333 winning percentage. That is the worst winning percentage of a World Series champion the year following their title. Note: The Red Sox .435 winning percentage on the morning of August 27 would rank second worst of all-time for a defending World Series champ. The current second-worst winning percentage of a defending World Series champ is .457 by the 1991 Cincinnati Reds who were 74-88 that year. The 2014 Red Sox will need to go 18-13 in their last 31 games to avoid tying the Reds for second place on the list. Following are the 16 World Series champs that finished below .500 the year after winning the championship. Did you notice that the Giants in 2013 finished under .500 after their World Series title in 2012? If the Red Sox also finish under .500 this year it will mean the last two World Series champs finished their next seasons under .500. It has never happened three years in a row!